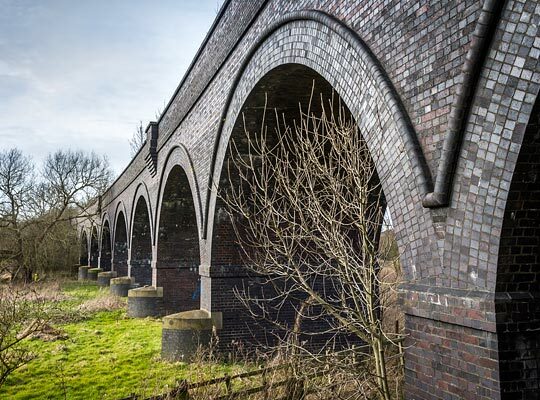 Striding confidently cross country for 26 miles, the route between Kettering and Huntingdon - surveyed by J B Denton - emerged under the auspices of the Kettering & Thrapston Railway, the company having been incorporated in 1861. The section of line between these two places received Royal Assent in July 1862 and was developed to exploit considerable local iron ore deposits. There was however a bigger goal - to connect the manufacturing districts of the Midlands to the east coast. This involved an extension to Huntingdon for which Parliamentary approval was granted one year later. The company name changed to reflect this, becoming the Kettering, Thrapston & Huntingdon Railway. Appointed as its engineer was George Barclay Bruce whilst Messrs Waring Brothers were awarded the construction contract. The cost of the line was £305,600 or about £28.9 million today. 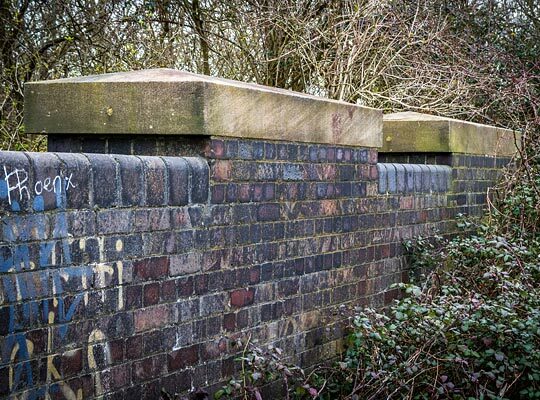 The work was easy going by railway standards, the landscape being generally flat in character. Despite this Captain Rich, the Board of Trade’s inspector, refused to approve the line’s opening when he first carried out an inspection. He revisited on 15th February 1866, after a winter of improvement works had been completed. Six days later, with trains authorised to run, the goods service was inaugurated. Whilst nominally independent, the KT&HR was absorbed into the Midland Railway - effectively its longstanding parent company - in July 1897. The line’s most notable structure carried the single track over the River Nene on the western approach to Thrapston Midland Road Station. 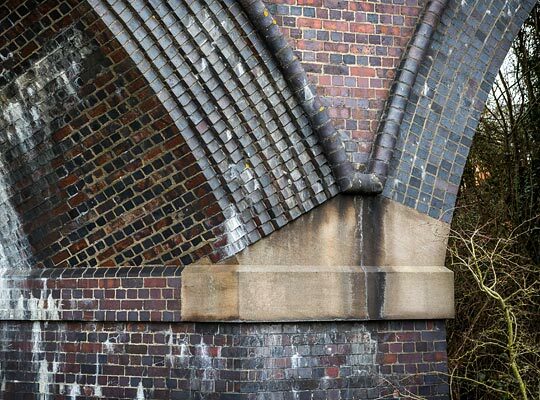 Curving to the south on a radius of about 23 chains, the viaduct comprised two parts - Bridge Nos. 21 & 22 - separated by less than ten yards. It featured simple plate-girder deck sections supported by piers comprising two braced cast-iron columns. Some of these were additionally strengthened by raking timbers. 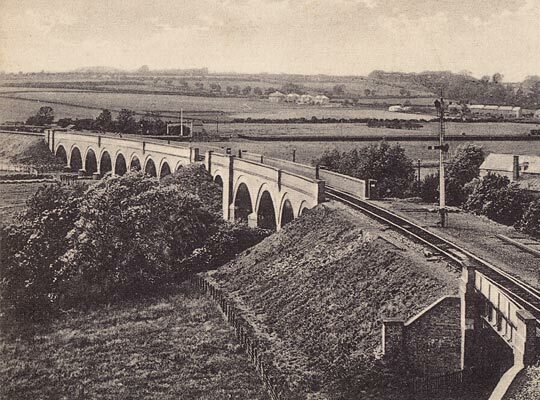 The original structure was replaced - possibly in 1921-22 - by the existing brick viaduct, the worksite being supplied by a contractor's railway laid across the fields. Once complete, the first locomotive across was No. 3262; driver Charles Hamson and fireman Arthur Bellamy, both from Rothwell, formed the footplate crew. Mapping evidence indicates that the new viaduct was built slightly to the south, resulting in an easier curvature of around 29 chains. 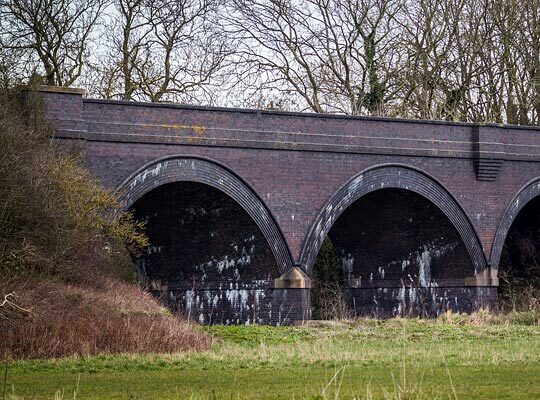 From the west, Thrapston Viaduct is located at the end of a lengthy, high embankment which was penetrated by the London & North Western Railway’s Northampton-Peterborough line 150 yards from the western abutment. It is predominantly brick-built, the exceptions being the large dressed capstones above the cutwaters - mostly protecting the south-side of the structure - and abutment buttresses. These are all skilfully masoned. 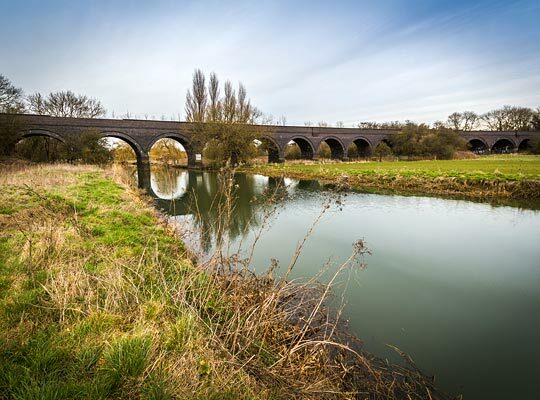 The longer of the viaduct’s two parts extends for 125 yards over the main leg of the River Nene and its flood plain. It comprises nine 30-foot spans and climbs to the east at 1:130. 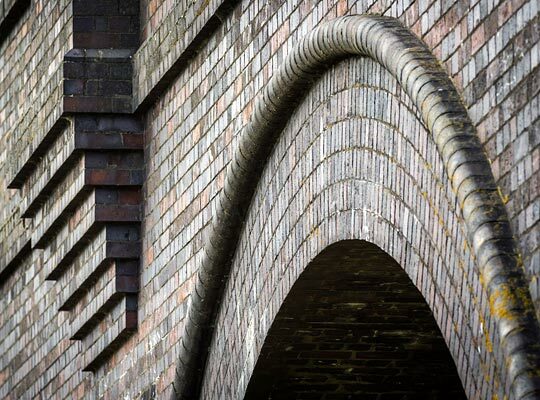 The segmental arches have six brick rings and are protected from water penetration by a bull-nosed oversail. Alternating from side-to-side are cantilevered refuges, generally over every third pier. 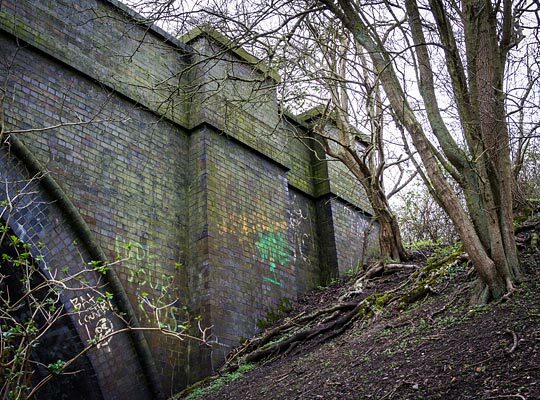 At its eastern end is a short embankment leading to the other viaduct. 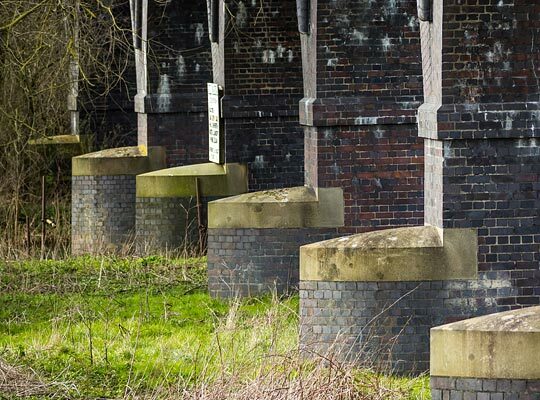 This has five spans, two of which are skewed - with eight brick rings - due to the water flow. For arch springing purposes, geometrically complex imposts had to be cut to sit above the piers. The smaller eastern approach embankment accommodated the line for 90 yards, as far as the Denford Road underbridge which was removed in 1982. The exhaustion of iron ore deposits threatened the line’s existence during the 1920s but its strategic importance came to the fore during World War II when it was used heavily for the movement of personnel and armaments. This was however only a temporary reprieve. The harsh economics of the 1950s and emergence of road transport led to the official withdrawal of passenger services on Monday 15th June 1959, the last train having actually departed Thrapston on the evening of Saturday 13th. In 1961, the through route was severed with the lifting of ten miles of track towards the branch’s eastern end, between Kimbolton and Huntingdon; it thereafter was operated as a long siding. The daily goods train was withdrawn on 28th October 1963, signalling closure for the section of line over the viaduct. 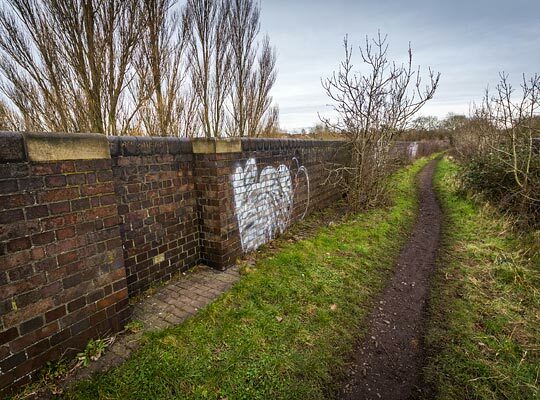 Apart from some missing copings, the structure remains in excellent condition and locals continue to use it as an informal footpath. 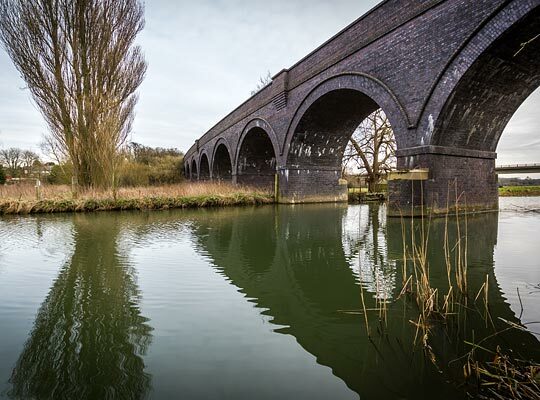 Late in 2015, it was bought by a company entitled Thrapston Viaduct Limited, with Mr Christopher Gibbard named as its only director. The purpose of the acquisition is not known.